Every year on the “Day of the Dead” the streets of Mexico come to life. From Mixquic to Tuxtepec colourful parades with music, candy, flowers and sugar skulls take place. We combined this elements into our very own flower skulls. This traditional and ancient fiesta invites everyone to commemorate friends and relatives who have passed away. They are honoured with love and respect: properties our peonies radiate as well. The theme may be ‘death’, but that doesn’t mean this is a gloomy festival. Sugary treats, upbeat music and dancers in fantastic costumes make sure you’ll be in the highest of spirits by sundown. And why not? 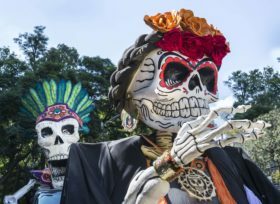 The rituals associated with this holiday are La Calavera Catrina – the vain, elegant skeleton lady, and of course flowers. That’s why My Peony Society celebrates this day with peonies. Our peonies symbolize life and a great party. Thanks to efforts by the United Nations Educational, Scientific and Cultural Organization, or UNESCO, the term “cultural heritage” isn’t limited to monuments and collections of objects. It also includes living expressions of culture—traditions—passed down from generation to generation. In 2008, UNESCO added Día de Muertos to its list of Intangible Cultural Heritage of Humanity. This notes the important role the ‘encounter between the living and the dead’ plays in the local society and culture..
Look spectacular, in a selfie! At My Peony Society, we’re as much in love with peonies as we are with life itself. We can’t think of a better way to experience life in full bloom than taking in the beautiful colours and mesmerising fragrance of our peonies. That’s why we thought the Day of the Dead to be an especially fitting theme for our stand at the International Floriculture Trade Fair. We challenged visitors to surprise themselves, set their spirits free, and to look spectacular in a selfie with one of our flower skulls. My Peony Society is the world’s foremost cooperation of peony growers, traders and florists. Our expert growers craft the perfect peonies, in a wide range of colours, with a unique full bloom guarantee. Thanks to our international growers and modern transport techniques we’re able to offer fresh peonies to a worldwide audience, nearly year-round.